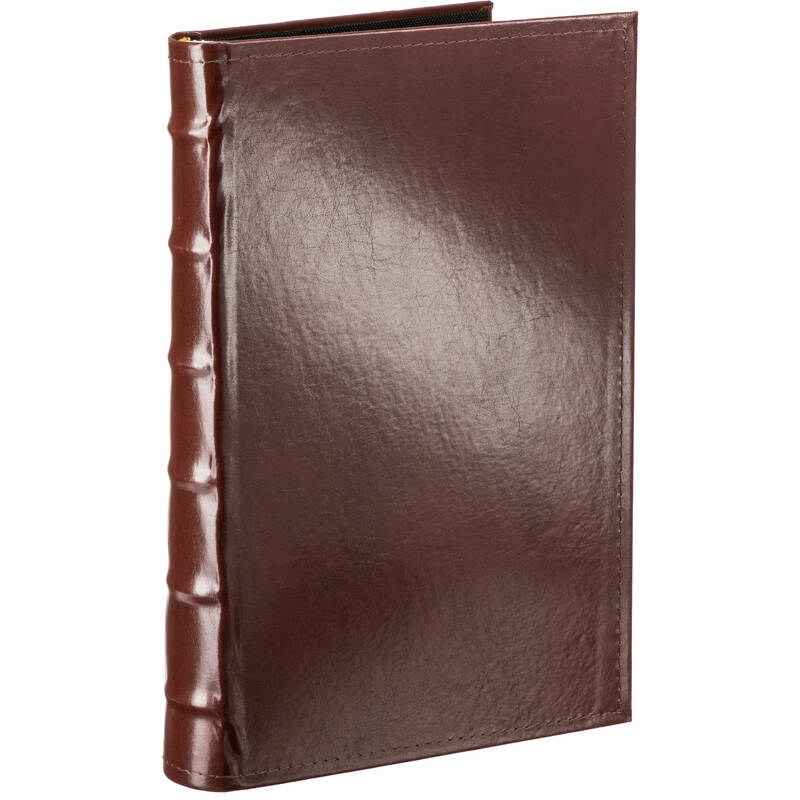 Holds Panoramic Photos up to 4x10"
The Pioneer CLB-346 Sewn Bonded Leather Bi-Directional 300 Pocket Album features a brown leather cover and is designed to display and protect 300 4x6" photos. The 3-up style pages can display three horizontal or two vertical images per side. It will also accommodate one vertical APS panoramic image per side. The clear, side-loading pages protect your photos from dust and fingerprints. The shaded background on each page enhances the presentation of your photographs. There is a memo area next to each photo. The book-bound binding enables the open pages to lay flat for quick loading and optimal viewing. The album is acid-free for long-term archival photo-storage. Box Dimensions (LxWxH) 23.9 x 15.55 x 1.8"
CLB-346 Sewn Bonded Leather Bi-Directional 300 Pocket Album (Brown) is rated 4.7 out of 5 by 25. Rated 5 out of 5 by Michael F. from Great for storing-displaying 4x6 prints I bought this at the same time as several other magnetic Pioneer albums for larger-sized prints. But both me and some family members have shoeboxes full of 3R/4R (4x6) prints from the days of photo stores and film. I haven't begun filling this yet, but can say that it comes thickly packed with pages (albeit for 4x6 prints or smaller), and while thick to begin with, will hold up to 300 prints (10 or 20 rolls worth of prints). I'm thinking that rather than trying to expand this, I'd buy a few more, as they work well on a table top or on a bookshelf, appearing like old-fashioned bound leather books. Rated 5 out of 5 by Badwater from CLB-346 Sewn Bobded leather 300 pocket album by Pioneer Albu I have been shooting the progress of a $3million (plus) salmon recovery project funder by the Yakima Indian Nation. Once or twice a week I gain entrance to the project and photograph workers on or off many laders and back hoes. Using 4x6 prints created in a sumpled Canon Selfy printer using both battery on site and commputer in the office I have fouond this album the the easiest to load I have ever used. However verticle prints have to be cropped to retain that aspect in the book. Rated 5 out of 5 by Toxoplasmosis from Great Photo Album The album is great! It looks great on the shelf and holds photos many ways. Also love the area to write next to each photo. Rated 3 out of 5 by Robert from A Steal at the Price This attractive leather bound photo album is the perfect repository for the printed copies of my digital images. There is a space next to each pocket for a short description of the picture you displaying. Although I wish it could hold more than 300 photos this product was an absolute steal at $12.00. Similar photo albums bought elsewhere would cost three times as much. Rated 5 out of 5 by Mario from Great Quality and Value Compared to the junk you find at some retail outlets, these albums are superior in appearance, quality, and build.? While the bonded leather has a nice feel, they are shipped with a dust cover that I opted to leave on to keep the albums clean.? I would definitely recommend these and intend to buy more as the need arises. Rated 5 out of 5 by Anonymous from Just What I Needed Bought this to match an album I received as a gift a few years ago. So glad B&H had it in stock. Good sturdy album for the price. Love the ability to write in the memo section next to the photos. Like the fact that it can hold photos in multiple directions and can hold panoramic prints. Rated 5 out of 5 by Bill Urban Photos from Excellent, inexpensive display I keep the many 4x6 prints I make here, and its elegant binding gets commetns, even before I show my work. Perhaps there ought to be non-shiny glassine slots for the photos, but that's a minor problem. Very useful and professional-looking item. How are we supposed to know what size the pockets are? The pockets are 7.5 in. long, 3/4 in. high. There are 9 pockets on each page. Hi. I am wondering if there is a mechanism on this album's pages to prevent vertically oriented 4x6 prints from slipping out from or shifting within the side loading pockets. From the pictures it seems that the stoppers/print separators towards the edges of the pages would keep horizontal prints in place, but there doesn't appear to be anything that would keep a vertical print fixed in its place. Is there? no there isn't, but it really isn't a problem for me. a friend of mine uses a small piece of double sided tape. I love these albums.